Superstar athletes are a lot less accessible to the media than they used to be. There was a time a writer could cover a football (soccer) match in London, file their report on the whistle and then share a few pints in a pub with the players afterwards, but not anymore. Agents and teams fiercely control their most valuable assets in today’s world, which makes any exclusive access the media can procure all the more precious. To get one-on-one with a truly global sports star is no easy thing to achieve and can take months to broker—even for a brand as powerful as Bleacher Report on home turf. All of which makes our B/R UK Google+ Hangout this week particularly remarkable, and something none of us involved with will forget. Just a week after first discussing the opportunity, we were joined live by none other than Lionel Messi—the greatest footballer on the planet and arguably the finest ever to lace his boots. Messi is as big a “get” as they come. His cameo might have been brief, but to have him address our Hangout guests and Bleacher Report readers was a major coup for our world football coverage and B/R’s profile globally. He was only too happy to offer up a signed Argentina shirt for a competition and to pay his respects to our marquee columnist Stan Collymore. It was fleeting, but it was class personified. Flanked by B/R writer, and Messi biographer, Guillem Balague, Messi came across as he’s always been portrayed by those who know him—as humble, gracious and appreciative of his millions of fans worldwide. To think that just four years ago our world football coverage would have barely registered outside of the U.S. Here we are now, building towards the 2014 World Cup, and the game’s biggest star—or at least those who manage his time—considered it a worthwhile exercise to attach himself to Bleacher Report’s brand. Messi’s appearance is added to a number of other world football exclusives we’ve managed to broker this year—including interviews with Liverpool manager Brendan Rodgers, their forward Daniel Sturridge and Barcelona’s Gerard Pique. It’s becoming harder and harder to make these things happen in today’s sports landscape, which makes it all the more special when they come to fruition. Sometimes it’s timing, sometimes it’s luck. 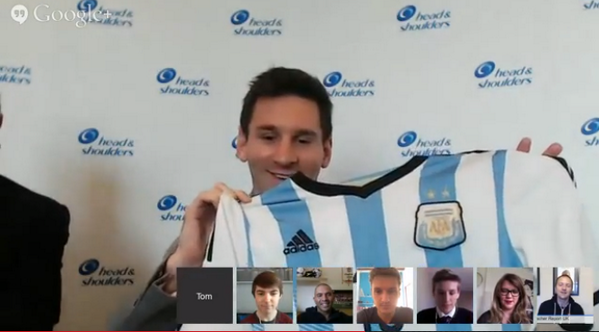 In the case of Messi’s appearance, it owed everything to the increasing strength of Bleacher Report’s global brand. Messi on Bleacher Report. Now that’s a “get.” Here’s to more of the same. Will Tidey is World Football Editor and a Lead Writer at Bleacher Report. Follow him on Twitter @willtidey.